I've had this on the wall in the F&C workshop for years and never really found a use for it until recently. I'm in the privileged position of having access to every other type of saw under the sun, so perhaps it's no surprise that this monster rarely came down from the wall to find out how effective it could be. 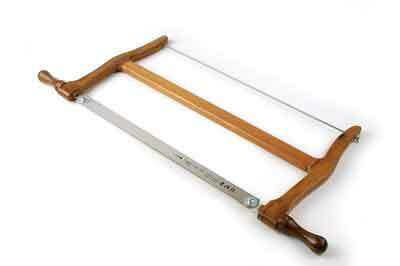 First of all, the Classic is not a typical frame saw as it comes with a Japanese-style blade. The universal tooth pattern renders it suitable for crosscuts as well as ripping with a slight bias towards the latter. Starting a cut with the frame saw requires a level of concentration above that required for any other saw; balance is top heavy, no matter how well grounded your stance is or how in tune you are with the stroke. This momentary lapse is short lived, however, as once the blade is established, things start to take care of themselves. The combination of a Japanese blade in a Western frame allows the best of both worlds. What starts out as either a pull or push stroke - both are possible - can quickly be reversed without removing the saw from the cut. Assuming the workpiece will allow it of course. The Turbo-Cut blades are quick, which means you can run off very quickly if not paying attention. The upside is that resawing is a much less painful exercise than it could be. The teeth are set to 0.85mm from a 0.6mm-thick blade and laser hardened to around 70RC, so cannot therefore be sharpened. In my opinion, it's this fine tolerance that makes the Turbo-Cut blade such an effective resaw option. My advice is don't waste your time on kits to build your own, however romantic the notion, and certainly don't cobble something together from remnants as you'll never match the performance of one of these.